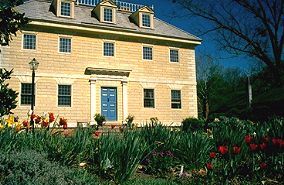 Newport House was built to Museum standards in 1988 from 1756 design by Colonial architect, Peter Harrison and is furnished completely in the period. Two large rooms, each with private bathroom; air conditioned; children welcome. Full breakfast often including authentic Colonial recipes and produce from our garden; Located only 500 yards from historic area; No smoking. Every Tuesday evening Locals and Visitors come to our ballroom for authentic Colonial dancing; Beginners and Spectators welcome. Your host is historical author, former museum director and Captain of historic square rigged ship. The Bed and Breakfast Inspected and highly rated by ABBA and BBAV. 2001 Rates: $150-190.